Researchers at the U.S. Department of Energy's Oak Ridge National Laboratory (ORNL), working collaboratively with scientists funded by The American Chestnut Foundation, have helped confirm that addition of a wheat gene increases the blight resistance of American chestnut trees. The ORNL team, in collaboration with foundation researchers led by Drs. William Powell and Chuck Maynard of ESF, used gas chromatography-mass spectrometry to analyze chestnuts from transgenic American chestnut trees-trees that were transformed with a wheat gene to increase resistance to blight. Results also showed that the transgenic chestnuts had similar metabolite concentrations to a panel of non-transgenic nuts, suggesting that they are edible. "We found that the wheat gene kept oxalic acid (oxalate) concentration-a key fungal necrotic agent-from accumulating, and the only substantial difference from non-resistant trees was a slightly lower level of gamma-tocopherol, a form of vitamin E," said Dr. Timothy Tschaplinski of ORNL's Energy and Environmental Sciences Directorate. The level of gamma-tocopherol was the same as in non-transgenic Chinese chestnuts, which are commonly eaten around the world. Chestnut blight, caused by Cryphonectria parasitica, a fungus accidentally introduced from Asia in the late 1800s, has caused American chestnut populations to crash from stands making up around a quarter of forests in the eastern United States to a handful of large trees and patches of saplings scattered throughout the region. "The resistance of American chestnut to the blight is extremely low," Tschaplinski said. "Virtually any adult tree will succumb to the fungus very quickly and, in as little as three days, the fungus can girdle the stem of a test seedling." Part of the reason the fungus is so virulent is because it produces oxalate, which causes chestnut tissues to rot. The wheat gene (oxalate oxidase) that was introduced into American chestnut by the research team associated with the New York chapter of The American Chestnut Foundation breaks down oxalate, helping to limit the deadly effects caused by the fungus. "If you can stop the microbe from accumulating oxalate, you can definitely slow the disease progression," Tschaplinski said. In addition to their forest dominance, American chestnuts were an important food source for forest animals. Before planting any transgenic American chestnut trees in the wild, regulatory approval by the U.S. Food and Drug Administration and U.S. Department of Agriculture Animal and Plant Health Inspection Service will likely require verification that the seeds are safe to eat. ORNL's role was to validate the concentration of oxalate in the plant tissues and assess for the production of any unexpected or unusual metabolites in the seeds relative to that observed in a panel of wild-type (nontransgenic) seeds. 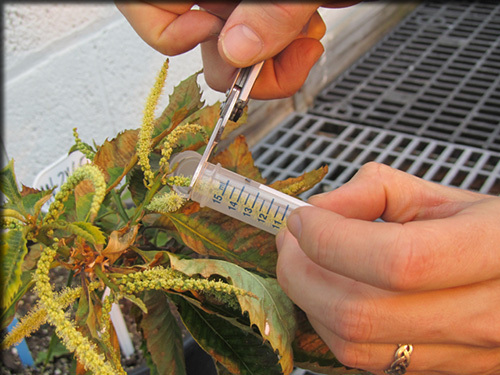 "The ORNL analyses help provide evidence of improved disease resistance, as well as minimal impact of transgenesis on nut quality," Tschaplinski said, adding, "A lot of American chestnut lines, including both transgenic and nontransgenic lines, are being developed for improved resistance. "We're helping identify which lines have, or which are likely to have, improved resistance, and the underlying biochemical mechanisms." While chestnut-hungry diners won't yet be standing knee deep in chestnut piles described in tales of old, the study is another step in reviving the forest's mighty giant. Tschaplinski leads the Metabolomics and Bioconversion Group and conducts broad-spectrum metabolite profiling analyses for a wide array of studies related to bioenergy and plant-microbe interactions. The ORNL research was supported by the Department of Energy, Office of Science, Biological and Environmental Research, as part of the Plant-microbe Interfaces Science Focus Area, based at ORNL in Tennessee. ORNL is the largest science and energy national laboratory in the Department of Energy system. ORNL's scientific programs focus on materials, neutron science, energy, high-performance computing, systems biology and national security. UT-Battelle manages ORNL for the Department of Energy's Office of Science. The Office of Science is the single largest supporter of basic research in the physical sciences in the United States and is working to address some of the most pressing challenges of our time. - This news release was prepared by the Oak Ridge National Laboratory Office of Communications.